The other day the husband person introduced Betty to a favourite fish and chip shop (just down from Karangahape Road, and with an excellent hygiene rating), and Betty had her first hot dog. New Zealanders, when they say hot dog, generally mean a battered sausage on a stick, rather than a frank in a bun with mustard. It was quite exciting for Betty to find a vegetarian one on the menu, and so she bought one with sauce, and ate it in the v. lovely park underneath the harbor bridge. The chips were also good. Simple pleasures. 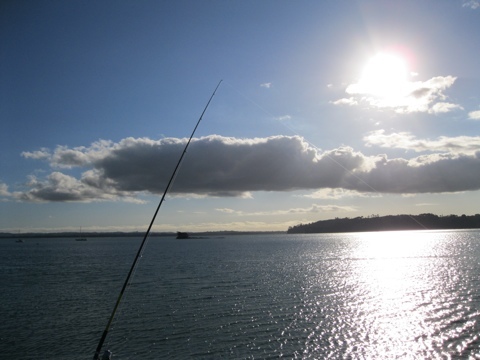 This entry was posted in Auckland, Food and tagged Auckland Harbour Bridge, hot dog, Sausage, vegetarian. Gracious. Was it tofoid, or nut meaty? It was sort of spongy, if I’m honest. 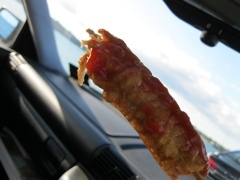 Still, a battered sausage on a stick shouldn’t really be too classy, should it?